Lag screw shields are a two-piece assembly made of two semi-cylindrical hollow sections interlocked at the top, allowing the shield to expand when in place. 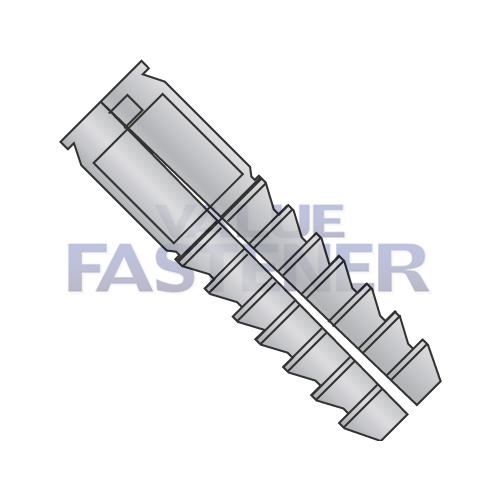 The bore of the lag screw shields is tapered, has an internal thread for about 2/3 of the length from the bottom and a ribbed outer surface which resists "backing out" of the hole into which it is inserted. Lag screw shields are medium-duty anchors which expand to fill the area of the pre-drilled hole when a lag screw is tightened into the shield. Extra-long sizes are for use in mortar or brick. Standard lengths are intended for use in concrete. Lag screw shields can be used in solid or hollow base materials and are more resistant to temperature fluctuations and rust than other light-duty anchors.